Documentary film La Voce Stratos (2009) by Luciano D'Onofrio & Monica Affatato, Courtesy Luciano D’Onofrio. Sound-video installation documentation Demetrio e il Sogno di Antigone (2016) by Francesco Kiais, Courtesy CRAMPS Records (Sound documents) and Luciano D’Onofrio & Monica Affatato (Video documents). As part of the co-curated section THE DREAM OF ANTIGONE :: Performance Art In Greece Between The Seventies And Today by Francesco Kiais | G.A.P. Gathering Around Performance. 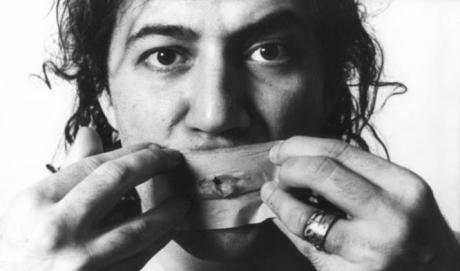 Demetrio Stratos (Efstratios Dimitriou) (born 1945 in Alexandria, Egypt; died 1979 in New York) was a Greek lyricist, multi-instrumentalist, music research as well as co-founder and frontman of the Italian progressive rock bank Area. In 1976 Stratos started to dedicate his activity exclusively to the individual vocal research. His extensive studies of ethnomusicology, vocal extensions, Asian music chants, and psychoanalysis let him to inquire a close relationship between spoken language and the psyche, as well as the limits of the spoken language. Stratos extraordinary vocal abilities comprised a demultiplying acoustic spectrum in diplophony, triplophony and quadrophony. His power lies in the use of the body as an instrument, not only as a musical instrument but also communicational, political, and therefore, as an instrument able to act in the social. Stratos' creativity lies within the frame of a period that generated radical changes of which we still feel the echoes, just as for his voice, as a search of a possible cultural identity within the complexity of contemporaneity. The documentary film La voce Stratos (2009) by Luciano D'Onofrio and Monica Affatato. The film has a biographical narrative structure, immersed in the social climate and historical and social context of the 1960s and '70s. It highlights the figure of the music and voice researcher and performer Stratos. Based on an archive of images including the viewpoints of artists and people who shared artistic experiences with Stratos, the film also includes the contribution of the members of the legendary vanguard music band Area. 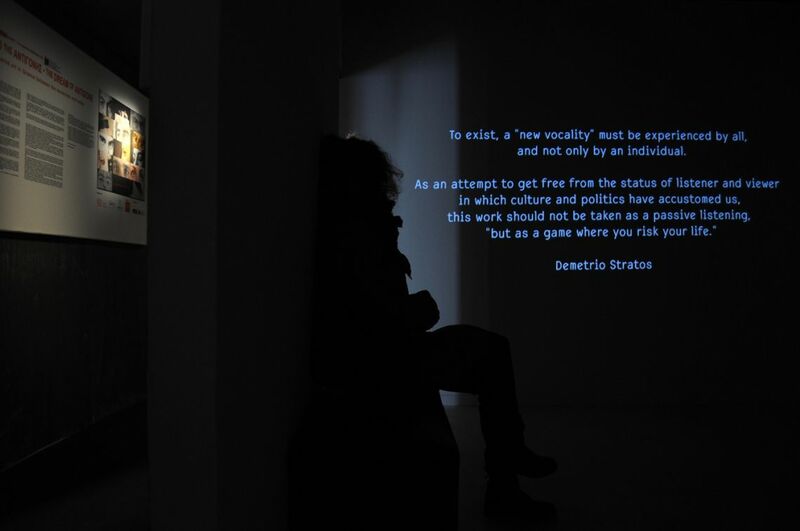 The sound-video installation and documentation Demetrio e il Sogno di Antigone curated by Francesco Kiais, with sound excerpts from Stratos' LP albums Metrodora (CRAMPS Records/DIVerso n.5, Milan, 1976), Cantare La Voce (CRAMPS Records/ nova musicha n.19, Milan, 1978) and Le Milleluna (CD CRAMPS Records, Milan, 1979). These are accompanied by images and graphic diagrams of his voice, as well as texts and video footage of Stratos interpreting Artaud, explaining his vocal techniques, and rare interview material (among others by John Cage). All photographic images courtesy of Lelli & Masotti – Lelli e Masotti Archive (partially takem from the book Stratos e Area, Arcana Edizioni). • Special event | Screening: 15 Dec, 15:30 - 19:00 (3 projections): Documentary La Voce Stratos (2009) by Luciano D'Onofrio & Monika Affatato. Courtesy Luciano D'Onofrio.